Slice Of Slim: Hot Off The Press NEWS! : My Film Debut! 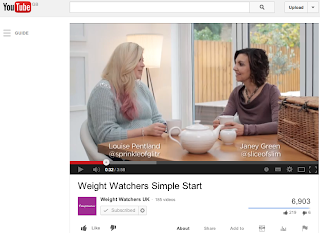 Most of you will probably have seen the WeightWatchers SIMPLE START film on Youtube by now! I had a meeting with the social media team at WeightWatchers in October last year and I'm now going to be involved in quite a few projects with them as an avid member and food blogger. I filmed this in December but wasn't allowed to say anything as it was TOP SECRET but I've been bursting to tell you all about it! Obviously, I needed to understand certain facts about SIMPLE START so I had read the book about a million times and had already started my recipe development by then but they cut the bit out where I talked about my pizza and shepherds pie recipes! Louise (A.K.A SprinkleofGlitter)is a very well known Youtube blogger with her own lifestyle channel. She is on a "GlitterGetsFitter" quest this year, so wanted to find out more about WeightWatchers as she was thinking of joining. WeightWatchers asked me to speak to her as a real member who has lost weight with them and explain a little bit about SIMPLE START from a members perspective. We were filmed for about 4 hours but it's only a 2 minute film so it was just meant to give potential and current members the encouragement to give it a go…and I couldn't give it all away or nobody would have needed the book! I was pretty nervous but the director from Saatchi and Saatchi was so kind and really put me at ease. If we made little mistakes or stumbled over our words, we just filmed it again. They had to ask me to stop speaking when I opened the hamper as it was really loud and squeaky! If any of you are trying SIMPLE START I wish you every success. I'll be posting recipes regularly on the blog so don't fear, you won't get bored! Janey, congratulations ! I only recently found your blog but you inspired me straight away with all your lovely recipes. I only have a little weight to loose to get back to the size I want to be, but really want to maintain it! I have signed up with Weightwatchers online and have just completed my first week and am really pleased with my weight loss so far. I will be a regular visitor and look forward to seeing all your wonderful posts during 2014.